While the beginning of Brayden Schenn’s first full National Hockey League season was a little rough, he had clearly established himself in the Flyer’s lineup by the All-Star break. He hasn’t looked back since. Throughout the Philadelphia Flyers’ short but exciting playoff run, Schenn was a human wrecking ball, hitting everyone in sight. 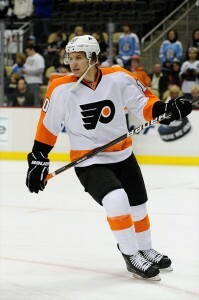 On top of his physical play, Schenn was also very productive on the score sheet, with nine points in eleven games. However, as most hockey fans know, stats don’t tell the whole story. Yes, Schenn was able to shine in some crucial moments for the Flyers, but he also showed the gritty, hard-nosed attitude that is needed to succeed in the playoffs. His “win at all costs” mentality was not only noticeable from the goals he scored, but also from the checks he dished out, and his play away from the puck. Coming into this season, everyone knew that Schenn had the talent and skill to put up points on a regular basis. He had proved all of that while playing in the Canadian Hockey League. The real question was whether his defensive skills would be good enough to warrant a position in the Flyers’ lineup on a nightly basis. Schenn stumbled out of the gate, however, it was mostly due to a string of bad luck. A shoulder injury took him out of the lineup in the preseason, and shortly after his return, he broke his foot in October. Upon healing each injury, Schenn was sent down to the American Hockey League both times for a conditioning stint, meaning he once again had to earn his way back into the NHL. In January, Schenn made his return to the Philadelphia lineup. While his point total of 18 in 54 games was by no means outstanding, Schenn proved to the fans – and mostly importantly, the Flyers’ brass – that he deserved his spot on the team. Come playoff time, Schenn had become a vital forward for the Flyers, and was expected to continue his solid play in the postseason. His performances against Pittsburgh and New Jersey were somewhat surprising though, to say the least. As the fifth overall selection in the 2009 NHL Entry Draft, high expectations were placed on Schenn from the moment he put on the sweater of the Los Angeles Kings. He had his best year in terms of points in the 2009-2010 season with the Brandon Wheat Kings of the WHL, putting up 99 points in 54 games. Schenn also played starring roles for Canada in the World Junior tournaments he participated in. So when he was traded in a blockbuster deal from the Kings to the Flyers that sent Mike Richards to Hollywood, Los Angeles general manager Dean Lombardi faced criticism for trading away such a hot young prospect. At the moment, it appears the move has paid off for both sides, and Schenn has clearly made his mark in the NHL. 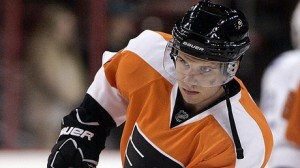 Like many young prospects, Schenn has also faced his fair share of criticism. Soon after he was traded, he was being called a “bust in the making.” However, as the younger brother of Toronto Maple Leafs defenseman Luke Schenn, Brayden made tremendous strides in the two rounds of the playoffs he participated in, and showed that he could be an essential part of Philadelphia’s lineup for the entire 2012-2013 season. Schenn knows that a target has been placed on his back due to his playoff performance, but with his days in the minors likely to be over, he knows he’ll be expected to continue to contribute offensively next season. If Schenn plays anywhere close to the way he did this past April, he could be a true force to be reckoned with come next spring.